The three-masted topsail schooner Atlantic was one of twelve vessels which competed for the 1905 Emperor’s Cup, a prize put up by Germany’s Kaiser Wilhelm for a race between New York and the Lizard (the extreme tip of Cornwall). Atlantic won the cup by achieving a time of twelve days and four hours. In one 24-hour period she ran 348 nautical miles. She was taken up by the US Navy in both world wars and was eventually acquired by the US Coast Guard Academy. Although the Atlantic was built as a racing craft, she had a stateroom accommodation for seven people. 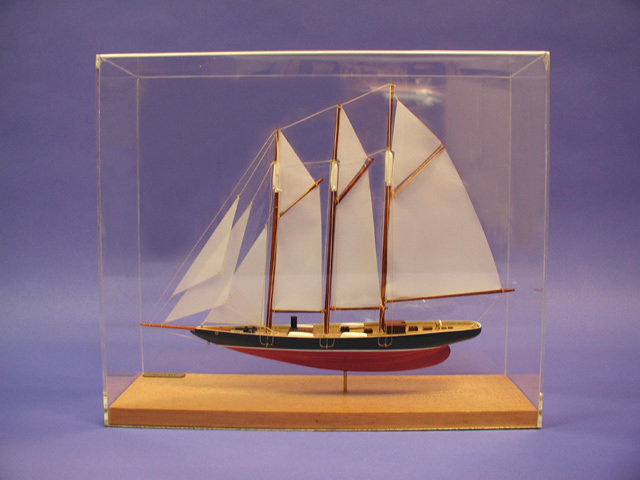 Model includes display case (shown). Dimensions (L x W x H): 13.0" x 4.5" x 11.0"